Biohacking The Hazards of Sitting. I’m a big fan of tweaking the environment in your home and your office to make you healthier and live longer (just watch this dirty electricity video to see what I mean). So this week, I’m headed to UC Berkeley to present a poster on “Biohacking The Hazards of Sitting” at the Ancestral Health Symposium. I don’t know if there’s still time to get in, but if you happen to be in the Bay Area, swing by and say hi. I’ll be presenting the poster from 3:45PM-4:45PM at Wheeler Hall on UC Berkeley Campus on Friday, August 8, and I’ll also be signing copies of my book “Beyond Training” at Bancroft Hotel’s Great Hall on Friday from 4:45PM-5:25PM. But let’s just say you can’t make it, and you’re still curious about this whole biohacking the hazards of sitting thing. Fear not. My poster is below – simply click it for a closer view, or you can click here to download it in .pdf form. Feel free to share on your own website, provided you simply do me a favor and give credit to BenGreenfieldFitness.com. Finally, if you do happen to be in the Bay area, I’ll also be racing the elite men’s heat at 8am on Saturday, August 9 in the AT&T Park Spartan Sprint. So you want a good stair running workout with some burpees, box jumps and spear throws thrown in, there may still be time to register for the race. 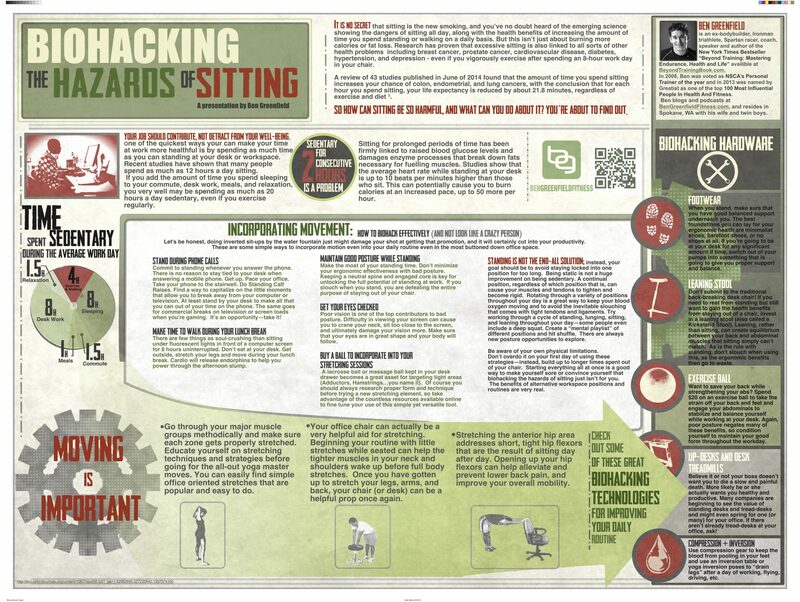 If you have questions, comments or feedback about biohacking the hazards of sitting, then leave your comments below (and if you have a standing workstation or you’re interested in making one for yourself, you’ll dig this thread over on the Ben Greenfield Fitness Facebook page). After listening to you describe the benefits of standing desks for so long now, I finally built my own! It consists of an empty printer box that I put on top of my desk… It works great! Is biking considered "sitting"? I just completed a two hour training ride… did I just take 43.6 minutes off my life??? Your life? No. Your back and pelvis? Possibly, unless you stood, stretched, etc.